Valerie and Jackie didn’t plan a specific area on the ship as the designated ‘Sick Bay’. There are first aid kits located throughout Bolo One, and it is small enough that anything can be retrieved in about two minutes, even if it’s on another deck. Should the need arise; the main work area on Deck One is plenty large enough to set up a temporary dental chair. Also, one of the garden bays on the Hydroponic Deck could serve quite nicely as a medical quarantine area, as the rooms are specifically designed to segregate one crop from another. Everyone has received the necessary vaccinations to ward off just about every known ill. For the most part, their medical needs should only consist of scrapes and bruises while on board the Hab. God forbid they should need emergency treatment outside the Hab, once they are on the ground. A broken bone could be dealt with by splinting, using whatever tools are on hand, but a massively breached suit can only be handle by burial or storage of the body. 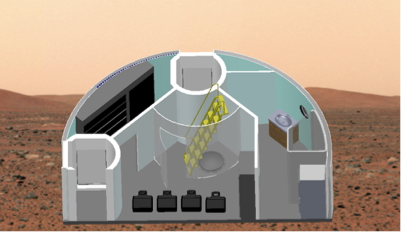 Cremation on Mars will have to wait until proper facilities can be constructed. The first deck has a pretty nice layout. The control area is not quite as large as the flight decks of the old Space Shuttles, but it doesn’t need to be. In fact, above the foot pedals controlling pitch and yaw, there is a counter-top with surface mounted digital displays, controls, and joysticks to operate the braking thrusters and roll. Just above the thruster controls is a pair of 17″ monitors, sitting one above the other, and two more monitors, one on each side of the first two, for a total of four, set in a plus sign formation. When the crew is preparing to land, these monitors will display forward, below, left, and right, respectively. 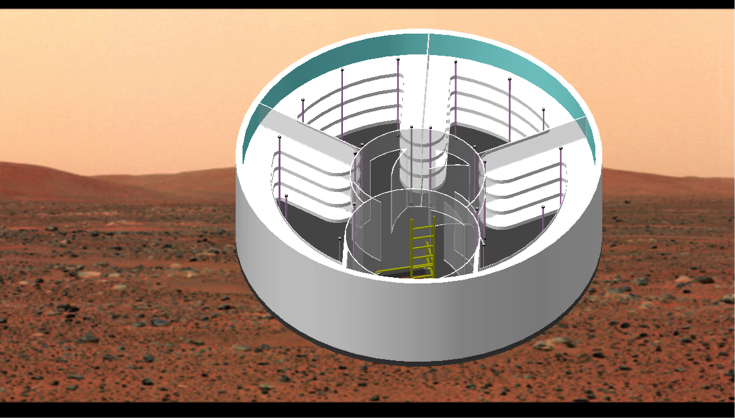 On the bottom monitor, they will be able to view the ground as seen from the area of the landing thrusters. Or, at least Tom can, as he will be piloting Bolo One down to the planet.